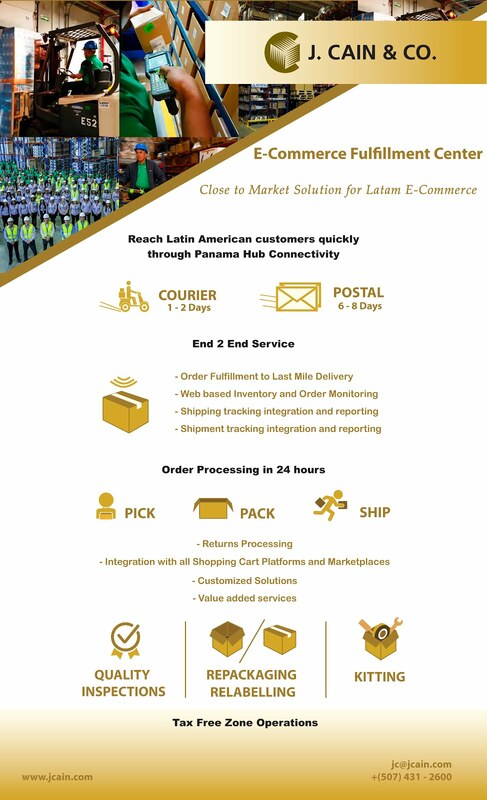 J. Cain & Co, the leading 3PL in Panama´s Free Zones, announces its new E-Commerce Fulfillment solution, an integrated platform to serve the growing direct to consumer segment in Latin America from a centric and convenient location. E-commerce is the fastest growing segment in retail worldwide, representing approximately 6% of retail in Latin America and growing at an incredible pace of over 15% per year. This new distribution channel requires a highly efficient, accurate, and fast logistics operation in order to have a competitive advantage in the market. J. Cain´s E-Commerce Fulfillment Solution based in Panama allows companies to ship their packages cross-border quickly and competitively to all of Latin America and the Caribbean, reaching the final customer in 2 to 4 days thanks to the excellent connectivity and ease of business of the Panama Logistics Hub. J. Cain bases its solution on its ability to apply innovative systems and processes solutions to optimize its WMS and integrate with online platforms, shopping carts, ERP´s, and with DHL Express´s shipping system for a fully automated operation. We invite you to explore our solution and contact us for further information.